Last night was the parents’ information meeting regarding our soon-to-be kindergartners from the Class of 2020 (how’s that for making you feel old – and I usually refer to myself as a girl… but that? I mean, that aged me about ten years just hearing that). Given that I would have put The Princess in Kindergarten last year if they’d have let me, I’m very excited about this fall, and very excited as she begins her school journey. Hubby and I enter the little multipurpose room (thank goodness they didn’t make us sit in the kindergarten sized chairs! ), and start counting faces of people WE went to school with. We live in the same small town we went to school in (though, I have to point out because it’s really worth noting: I didn’t move to Michigan until I was 13, and so I didn’t start out my school career with the same folks I graduated with – as Hubby did). As people filed in, a girl that was one of my closest friends in high school (and a college roommate for roughly 3 months before she moved back in with her mom) sat down next to me. We had been so close. Really – she was like family to me for a time… But… I had NOTHING to say to her. All we have in common now are where we’ve been, and the fact that our kids are going into kindergarten together. A few more people shared a few more details, and then we were released to roam the halls, interrogate the teachers, and scope out the classrooms. I notice my old friend hovered in a group with the same folks she has always hovered in groups with. And to be honest, it made me remember what these people were like when they were sixteen and seventeen and from just looking at them, it didn’t seem that they had changed too much. That WORRIES me. These are the folks I’m going to be in PTA meetings with (because you know I am SO joining the PTA). These are the folks I’ll be sitting on sidelines with at sporting events. When it comes time to plan the Senior Party (you know, in the year 2020)… It’s these people I’m going to be arguing about stupid party decorations with. Cringe. In the thirteen years since we’ve graduated, they haven’t seemed to change at all, and I can only hope that they all MOVE. So, I’ve been looking at my calendar for May and realize that each weekend is already booked with an activity and I only anticipate that getting worse as invitations to graduation open houses start trickling in (several graduating cousins this year on both my side and Hubby’s). In the midst of the already planned events and holidays, I have to try to plan The Princess’s FIFTH BIRTHDAY party. Should this be the year I plan a hundred games for Hubby to coordinate for the kids? The party will likely be the day AFTER the recital (I am not COMPLETELY out of my mind!). I have thought of keeping it VERY simple – taking The Princess and two or three of her friends to see “Shrek 3” and going out for ice cream. I don’t know if that will satisfy her: she keeps talking about a princess party (but she seems only to be inviting boys – I’m sure they’ll dig that). I really hate the birthday party madness. We have been to some awesome kids’ parties this year – but to be honest, Bounce Parties, frou frou stuff… it’s NOT my thing. I don’t want to compete in the birthday Olympics – I just want my kid to have fun and for my furniture to stay intact. (I know I should just dredge up my post from last year at this time… but humor me… she’s going to be five – and she’s an old five, like five going on fifteen). Saturday, after I spent 30 minutes wielding a curling iron, The Princess’s hair was back to straight/slight curl at the end by the time we reached the dance studio for her pictures. I admit, she looked absolutely adorable in her SEVENTY DOLLAR leotard, and I didn’t tart her up with too much makeup – some blush, a tad bit of mascara, and once I got to the studio, the required lipstick (which is Salsa Red by Mary Kay – which I can only describe as garish on a four-year-old – fine for, say, Gwen Stefani… on MY kid? It was a touch creepy). Some of the moms went all out on the hair and makeup thing. There was a girl who was about three who had the bright red mouth painted on. Seriously… scary. We commiserated in whispers for a few moments (it was fairly clear we were in the minority on the whole tarting-up-of-the-daughters thing), and it was a relief to know that I am NOT the only one feeling drained dry by the recital crud. Which is good to know. If I don’t get seven consecutive hours of sleep soon, someone may end up losing an eye (and by virtue of age, I think it will be Hubby). I was up THREE times last night. That isn’t including the several times both girls were up from the time we tucked them in to the time I went to sleep. I really REALLY hate teething. The Princess has been in dance class since the fall, and as we are winding down for the year, we are getting close to the yearly recital. Since we are dance class virgins, this is also our first recital experience, and I have to say, the whole thing makes me glad beyond belief that The Princess has already elected to return to gymnastics in the fall (as well as making Hubby happy by giving soccer a try). Dance class is scary. The class itself costs no more than a typical class – I’ve found that all dance schools, all gymnastics classes, in our area, well, they tend to cost the same each month. HOWEVER, her dance class has a dress code. Pink leotard, pink tights, special type of ballet shoe, special type of tap shoe (versus gymnastics – wear what you can move in, no footwear needed). Already, the expenses were adding up from day one. Now, closer to the recital, we had to shell out $75 for a recital costume and t-shirt (yes, I’m aware that spending $75 on a puny leotard and a t-shirt that probably cost the studio $5 is asinine – I can’t even imagine what percent they marked that up at the parents’ expense). There are hundreds of kids in the various dance classes. Hundreds of kids means thousands of parents, grandparents, siblings, friends who need to see the recital… at $12 per ticket. But before we get to the recital, we have… Recital Pictures. Which will ring up at a pretty $45. Nice. So, not just hair, they have VERY specific make up requirements. Right down to the color and how we apply it. My little four year old will be wearing more make up for the recital than I will wear all year. I have a big problem sending my kid out looking like some prosti-tot. I just don’t think four year olds need eyeliner – I know that the “stage lights wash them out” – but seriously? They’re dancing. You should be looking at their feet, and not if their eyes are defined. Which brings me to another fun one – no underwear allowed underneath the leotard. Now, this I sort of understand, IF the costume was just a little leotard. You don’t want the little undies peeking out – BUT The Princess’s costume has a skirt. And to be honest, four years old is a little too early to get in the habit of “going commando”. It really creeps me out that there are people in that studio thinking of this stuff. Once we’re at the recital, wouldn’t it be nice to video the girls to send to far away relatives that couldn’t be there? Oh, yeah. It would be. BUT (you knew there was a but), YOU CAN’T. No cameras allowed. If you bring in a video camera, they will take the tape/recording device and (this is their words): destroy it. But (once again, there’s a but) you can buy THEIR DVD recording of the show at $25 a pop. Hmmm. Money-making scam, much? Don’t even get me started on the insane number of rehearsals at inconvenient times where I’m going to have to juggle my life (as well as miss my stepbrother’s wedding) in order to get The Princess there. This whole thing has me so irritated that I’ve been seriously biting my tongue during class. I’ve been sitting in that waiting room, collecting pieces of paper with rules about this and that, and I think, they are just sucking the joy out of all of this for the parents. This has ceased being fun for me at the moment. All I can think of is getting this damn thing over with. And that stinks – I wanted this to be fun! Come May 25, we are DONE DONE DONE with dance. Thank goodness. The builders were here this morning to move the washer and dryer up from the basement to the new laundry room, and the contractor had assured me that this would be an easy task for them: they had hooks and pulleys or some-such newfangled equipment that would allow them to basically bound up the stairs with my washer and dryer strapped to their backs. I heard them struggling. Then I saw them struggling. I said to one guy, “Not easy, is it?” He was huffing and puffing and he said to me, “I don’t know HOW they got these things down here.” I made some remark about, “Well, gravity was in their favor” (yeah, they’re hating me now), and walked away. There was a full load of (dry) towels and sheets from the last load of laundry I had done last week. Whoops. No wonder the thing felt so heavy. It was. In my seventh grade english class, I remember my teacher requiring all of us to memorize a poem. I selected the poem “I Wandered Lonely As a Cloud” by William Wordsworth. Even all these years later (and it’s starting to feel like a LOT of years, believe me), I still remember this poem. Possibly because even now, the poem’s relevance is still with me – more so than it was when I was twelve. There’s always been a line that has resonated with me: “Which is the bliss of solitude”. I have always been the kind of person who needs time alone (hey, even Axl Rose said it: “Sometimes I need some time on my own.”). That has always been the case with me. I have always been the type who can sit in a room with the door closed and read or write or listen to music or daydream or do nothing for hours on end. I have often described myself as being somewhat “in my head” about things – if I have something on my mind, though I have some of the greatest friends put on this planet, I have rarely been the type to burden people with what I perceived to be “my problems”. I’ve been the type, instead, to think, dwell, analyze and resolve things on my own. I have always been that way. This weekend, it hit me so unbelievably hard that all I wanted to do was go away and be on vacation by myself – wanted to be somewhere where I had no one’s needs to meet but my own, and no one had any expectations of me. I arranged for my mother to take the girls yesterday and then Hubby tells me that he decided he wouldn’t be going to work. I know, I know – it’s contradictory, isn’t it, for me to say that I was upset because he was staying home, when I’ve complained for the past several months about how much he’s been gone?! But in my head, I was already READY for the bliss of my solitude – the girls with mom, Hubby at work, and the house so blissfully quiet. It’s not an easy feeling to feel like you need to push away the people you love and who love you, but… I kind of did that. Hubby went to work. The girls went to spend the day with Grandma. And after four hours alone, I felt a bit like my old self again. I was in a better mood. I felt a bit refreshed. And I was happy to see everyone again. I know that it is something that I will have to work out in the days and weeks to come, getting better at carving out the time for myself when I need it – rather than let myself get lost in the other chaos of our lives. 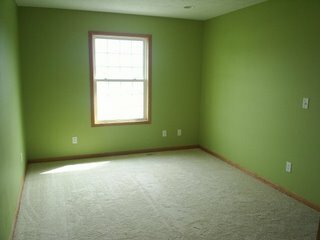 The walls are green…Behr Grass Cloth is the color – very vibrant – I love it! We should be wrapping up work on the master bathroom this week, and then I should be able to touch up the paint in the bathroom, as well as the mudroom/laundry room and then WE ARE DONE. After a long week filled with funereal things (including the visitation on Thursday, where the only family members present were me and my dad), I spent most of yesterday afternoon after the funeral in somewhat of a funk, and not really wanting to do anything or go anywhere. (And I didn’t realize until this morning that it was Friday the 13th, so go figure). As Hubby came home from grocery shopping last night, I asked him to please, please, please, wake up with Pumpkin should she wake up in the middle of the night. She’s pretty consistently been waking up around 1:30 or 2 — I know it is because she’s teething (again – freakin’ molars! ), and it’s been a few weeks now since I’ve gotten a full eight hours of uninterrupted sleep. Because it’s a Saturday and it’s still tax season, Hubby still needed to go to the office today, but there isn’t a set time for weekend hours, so I knew that he had a little leeway to be a nice guy and let his wife get some sleep. He graciously agreed. He asked me before I hit the hay what my normal routine is for when she’s up in the middle of the night – and I told him. Typically, I’m not up with her for more than 15 minutes (don’t get me started on how long it takes me to fall back to sleep once I’ve tucked her in). This morning, after exactly eight hours of sleep (ahhhhhhhh…), I got up and trotted downstairs and asked Hubby, “What time did she get up?” He told me 1:30-ish. I asked if she went back to sleep quickly. She was up for TWO hours. She’s pretty much just ensured that I’ll never get a full night’s sleep again! My guess is that she got riled up as soon as he flipped on the TV (and I didn’t ask, but I’m guessing if I were to have gone downstairs at 2, they’d have been sitting on the couch in front of ESPN). Needless to say, Hubby is exhausted. BUT – for a nice change of pace, I am not. So, I’m just going to continue to bliss on my well-rested groove for the day. Edited to Add: It’s not even 2 p.m. and I’m exhausted again, and ready for a nap again. So much for my bliss. Not only are we a week away from tax day, and recovering from last week’s spring break (no school! ), my dad has been in town from out of state because my Aunt Anne had been very ill. Actually, she was my dad’s aunt. If you notice the use of past tense, it is because she passed away on Easter. So, while we will miss her, it’s hard to mourn her passing, because it seems as though she was lost long ago. She was a woman who always had ice cream in the freezer and adored the color pink (so much so that her front door of her house was pepto bismol pink). She volunteered in the coffee shop at a local hospital, and she was very active in her church and other organizations. She called me ‘Sarah Bell’. The thing is, it had been months since I’d last seen her, and knowing how she was doing so poorly, Hubby and I went to visit her Sunday night. I am so grateful we didn’t wait another day, that we made the trip. My dad was with us and he told her we were there, and he said to me later that she got a smile on her face. In the span of time between when I’d last seen her and Sunday, she’d aged tremendously – I would not have recognized her. And that to me is the saddest part – that her vibrancy had faded. I’m sure that wherever she is, she’s having an animated conversation with whoever will listen, or she’s playing the piano, or eating a root beer float.